SILVER CITY – A dehydrated and starving Mexican spotted owl was resting comfortably at a wildlife rescue center here Monday, thanks to a Cliff ranching family that cared for the bird and notified the Department of Game and Fish. Brothers Hunter, 11, Dylan, 9, and Auston, 6, found the owl perched on a ceramic bear welcome sign while they were doing their chores June 29 at the Three Kute Kids Ranch near Cliff. They ran and told their mother, Kim Harris, who contacted Conservation Officer Matt Pengelly. The family agreed to look after the owl overnight while Pengally handled a call about a nuisance bear. “The three boys live on a small farm and are accustomed to feeding animals,” Pengelly said. “They see lots of wildlife, but this was a unique experience for them”. The Harris family gave the owl water, fed it some steak and kept a close eye on it until Pengelly arrived the next morning and took it to Dennis Miller, a licensed wildlife rehabilitator at the Gila Wildlife Rescue Center in Silver City. Miller said the owl was recovering well from dehydration and malnutrition, and appeared to have no injuries. It was able to eat a mouse without assistance on July 4, and Miller said he may be able to release it the Gila National Forest this weekend. Mexican spotted owls are native to New Mexico, where they breed in at least four counties. The owl is listed as a federally threatened species, but it is not considered threatened or endangered in New Mexico. Mexican spotted owls are exclusively nocturnal and normally are found in forested mountains and canyons with mature trees that create high, closed canopies, which are good for nesting. They are described as “perch and pounce” predators, typically locating their prey from an elevated perch by sight or sound, then pouncing on them and capturing them with their talons. 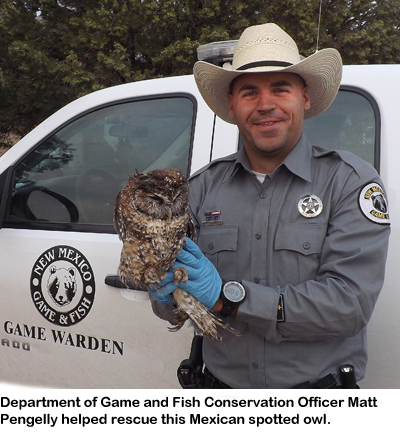 Anyone who finds an injured raptor or other protected wildlife is encouraged to call a Game and Fish Department office in Las Cruces, Roswell, Albuquerque, Santa Fe or Raton. Animals should not be approached or handled, especially if they appear sick or injured. To learn more about New Mexico wildlife, please visit the Department’s website at www.wildlife.state.nm.us.